Recently, JK Rowling admitted in an interview with Emma Watson that she sometimes regrets putting Ron and Hermione together romantically. Like the rest of us, she wonders whether bumbling, incompetent, lazy Ron could really have made the industrious and brilliant Hermione happy. Yes, Ron is lazy. Yes, Ron buggers off on Harry twice. Yes, Ron has inferiority problems. Yes, Ron is flawed. But Ron is also the most underestimated character in the series. Ron is continually underestimated by Hermione, by Harry, by his family… he even underestimates himself. If you actually WATCH Ron, you start to notice things. We all remember how Ron saved the day in the first book by winning the game of chess against McGonnagle’s giant chess set. If you think about it, that’s pretty impressive, since the artificial intelligence of the opposing side was meant to defeat adults. Maybe you, like me, dismissed this as an out-of-character moment, since Ron’s supposed brilliance at chess never really comes up again. When I started paying attention to Ron, I noticed that he never stopped winning at chess. 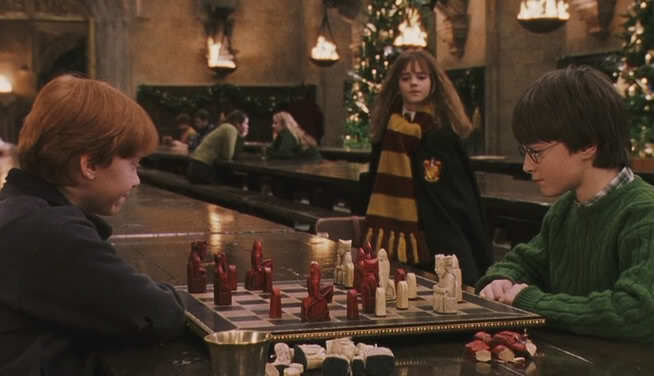 Hermione is always interrupting Harry and Ron at games of chess throughout the books, and Ron never appears to be losing. Now, if Ron is good enough at chess to win so consistently, he’s not the dimwit that so many of us tend to think he is. If anything, he is a good out-of-the-box thinker who keeps his cool in stressful situations. 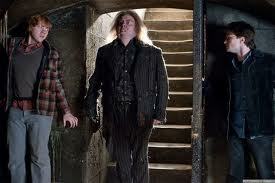 It is Ron who suggests Felix Felicis as a way for Harry to get Slughorn to cooperate in Half Blood Prince. It is Ron who thinks of fetching Basilisk fangs in Deathly Hallows. Furthermore, while we all tend to think of Ron as a poor student, he was one of only twelve students to take NEWT level Potions. In fact, he does well enough to attend NEWT level Transfiguration, Charms, Defense Against The Dark Arts, and Herbology. That means he got Exceeds Expectations on all of those OWLS. So, while he may not be the top of the class, he’s a B-level student at least, which is nothing to be ashamed of. Grades don’t necessarily equal practical abilities, of course. Look at Fred and George, who barely got any OWLs at all but invent all sorts of cool magical items, which Hermione herself describes as “extraordinary magic”. Ron may be bad at the more academic classes, like History of Magic, and he may have failed his first Apparition test (“just barely”, as Hermione points out in his defense). But he’s not actually all that bad at magic, especially in emergency situations. Don’t forget that he’s the one who knocked out the troll in his first year. In his second year, he cast a non-verbal Slug Vomiting Charm at Draco Malfoy and it worked. Unfortunately, it backfired on him because of his broken wand. But it WORKED. He picks up Defense Against the Dark Arts quickly – maybe more quickly than Hermione was willing to admit. He acquits himself well in battle, earning praise from Tonks, the Auror who rode with him in the Battle of Seven Potters. “Always the tone of surprise,” he said grumpily, breaking free. Always-underestimated Ron disarms Bellatrix Lestrange, saving Hermione, at Malfoy Manor, and helps to bring down Fenrir Greyback in the Battle of Hogwarts. Ron is no bumbler, and no liability to his friends in a fight. Ron is a true Gryffindor. The only thing that he fears is his own personal failures. Well, that and spiders. But Ron faces down an entire nest of giant spiders for the sake of a friend. Ron never hesitates to throw himself into danger to save the people he loves. A lot of this got edited out of the movies, where Ron was portrayed in a much more cowardly manner. In the movie version, Ron panics while Hermione coolly saves him from the Devil’s Snare. In reality, it was Hermione who panicked and Ron who snapped her out of it. In the movie version of Prisoner of Azkaban, Ron whimpers on the floor with his broken leg while Hermione throws herself in front of Harry. In the book, Ron was the one who stood up with a broken leg and put himself between Sirius Black and Harry. “If you want to kill Harry, you’ll have to kill us, too!” he said fiercely, though the effort of standing up had drained him of still more colour, and he swayed slightly as he spoke. Something flickered in Black’s shadowed eyes. Ron sacrifices himself a lot. 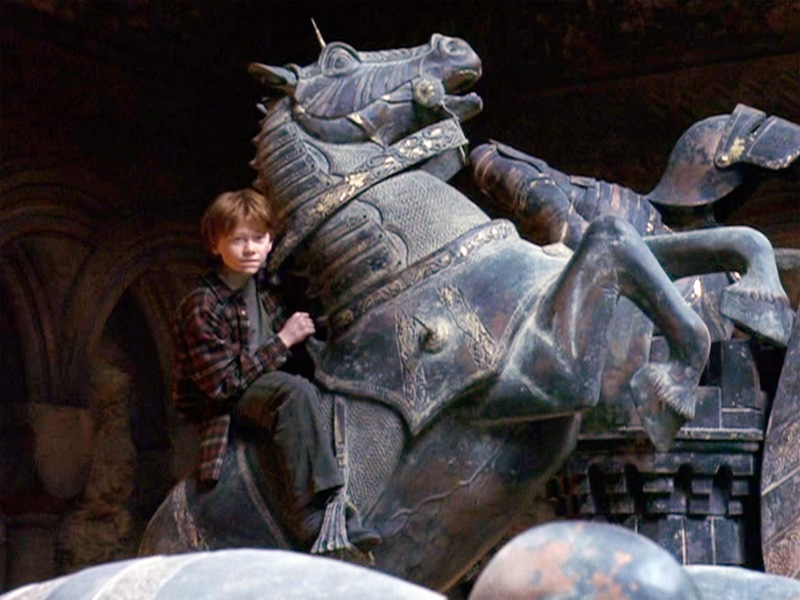 He lets himself get attacked by a giant stone statue so that his friends can save the Philosopher’s Stone. He throws himself in front of Harry’s would-be murderer. He disguises himself as Harry in the Battle of Seven Potters. He dives into an icy lake to save Harry and pull out Gryffindor’s Sword. He begs Bellatrix Lestrange to torture him in Hermione’s place. Ron may have his flaws, but he is no coward. Ron serves as the comic relief throughout the books. But the only one who ever gives him credit for this is the perceptive Luna Lovegood. He says very funny things sometimes, doesn’t he? Yes, yes he does. He brings light heartedness and wit to Harry and Hermione, who are far too gloomy when left to their own devices. Can I have a look at Uranus too, Lavender? From now on, I don’t care if my tea leaves spell ‘Die, Ron, Die,’ I’m chucking them in the bin where they belong. A brutal triple murder by the bridegroom’s mother might put a bit of a damper on the wedding. I don’t know how to break this to you, but I think they might have noticed we broke into Gringotts. IF WE DIE FOR THEM, I’LL KILL YOU, HARRY! This is one of the reasons why Hermione and Harry need Ron. There was much less laughter, and a lot more hanging around the library when Hermione was your best friend. When Ron leaves Harry and Hermione alone for months in Deathly Hallows, the playful banter that we see between the friends throughout the series disappears. There were loads of nights where we didn’t even speak to each other. With you gone…” He could not finish; it was only now that Ron was here again that Harry fully realized how much his absence had cost them. Ron balances Hermione. He tends to serves as a comic foil to Hermione’s know-it-all seriousness, and he forms most of the punch lines in their interactions. “Well, that clears that up,” said Ron. “It would have been really annoying if you hadn’t explained yourself properly. Excuse me, I don’t like people just because they’re handsome!” said Hermione indignantly. Maybe we assume that the comic relief shouldn’t be taken seriously, but for a character like Hermione, who desperately needs to be reminded to lighten up now and then, and someone like Harry, who broods far too much, Ron is vital to their mental health. Through most of the series, Ron’s tendency to imitate people just seems like part of his general wit. Ron’s impressions are not only funny, they’re genuinely well done. In Half Blood Prince he temporarily damages his friendship with Hermione by perpetrating a “cruel but accurate impression of Hermione jumping up and down in her seat every time Professor McGonagall asked a question”. But still, what use is that skill? As it turns out, It’s REALLY USEFUL. In Deathly Hallows, while Harry grapples with Wormtail, Lucius Malfoy nearly comes down to investigate. If Ron hadn’t pulled off a good Wormtail impression, they wouldn’t have been able to escape and run upstairs with Wormtail’s wand to save Hermione. But his ability to imitate is put to the ultimate test when he and Hermione break into the Chamber of Secrets, which can only be opened by someone who speaks Parseltongue. Ron pulls off an imitation of Harry hissing to Slytherin’s locket that is so convincing, it actually works. He was AMAZING,” Hermione said, “Amazing! So, it comes down to this: Ron is brilliant at chess, witty, not bad at school, a force to be reckoned with in battle, selfless, brave, with a handy ability to mimic others. …but everyone, including his friends, family, even his own author, thinks of him as being slightly useless. Let’s be honest about it – the Weasley family are basically considered to be the wizarding version of white trash – at least, by the other wizards. My father told me all the Weasleys have red hair, freckles, and more children than they can afford. Racism works along different lines in the wizarding world. No one seems to care particularly if you’re black or white. Instead they care about how “magical” your family is. The Weasleys are considered to be “pure-bloods”, which makes them the wizard equivalent of Aryan. But they are also considered to be “blood traitors” and are scorned by the wizarding elite. It’s Arthur’s fondness for Muggles that has held him back at the Ministry all these years. Fudge thinks he lacks proper wizarding pride. Nor do the Weasleys have a pile of inherited wealth like most of the other pure bloods in the books. Harry’s parents lived off of his father’s inheritance – they never held actual employment. Lucius Malfoy doesn’t seem to have an actual job, either. He’s just rich. He probably owns a lot of land and lives off of the rents. By contrast, Arthur Weasley works at a low-level government job, and supports his large family with a lot of scrimping and hand-me-downs. Ron, as one of the youngest children, is therefore also the most disadvantaged. I’ve got Bill’s old robes, Charlie’s old wand, and Percy’s old rat. Unlike Harry or Hermione, who get brand new wands that are specially matched to them and their abilities, Ron is handed an old wand that his brother didn’t want any more. That’s a huge disadvantage at school. First of all, it is stated many times in the series that while a wizard can make magic with any wand, a wand will never work as well for someone who is not its rightful owner. Unless Ron won that wand in a duel with his brother – which is unlikely – Charlie’s wand probably never worked properly for him, even before it got broken in second year. Furthermore, the wand must have been pretty damaged for Charlie to want a new one. Ron says himself that the unicorn hair inside is showing. 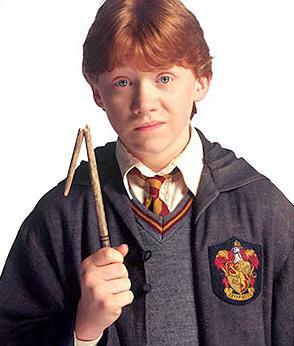 Then, once the wand was snapped by the Whomping Willow, Ron is forced to keep using it for the rest of the school year, even though it simply doesn’t work. It backfires constantly, injuring Ron, Professor Flitwick, some unfortunate beetles, Seamus, and finally Gilderoy Lockhart. Sometimes it smokes for no reason. No wonder Ron did badly in class when he was younger. The Weasleys are a humble family in general, tending to think of others before themselves. But Ron takes his humility into the depths of an inferiority complex, and who can blame him? Everyone expects me to do as well as the others, but if I do, it’s no big deal, because they did it first. Ron comes into Hogwarts with a “why try” attitude that he doesn’t really outgrow until the last chapters of the last book. 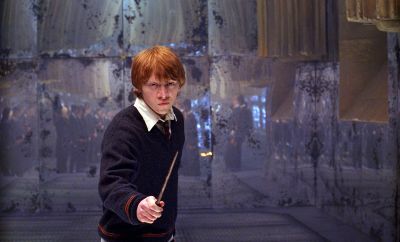 He spent his childhood being teased by Fred and George, the youngest and therefore most incompetent of the Weasley boys. His successes are compared to those of his older brothers, but his mother uses her older children’s successes to shame her younger children when they come up short. 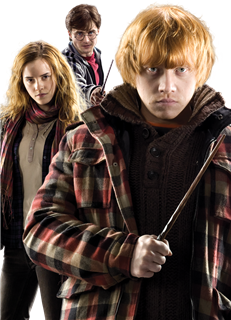 Ron stands there with his smoking, broken, hand-me-down wand while brilliant Hermione succeeds at everything and famous Harry gets all the attention. His own conviction that he’s useless at everything tends to create self-fulfilling prophecies. “Has Ron saved a goal yet?” asked Hermione, peering over the top of Magical Hieroglyphs and Logograms. A lot of people in Ron’s position would try to minimize the successes of those around them. They would turn into bullies like Malfoy who make themselves feel bigger by putting others down. But Ron is always the first person to tell Hermione how smart she is, or to congratulate Harry when he does well. “Knew you’d be top in Defence Against The Dark Arts,” said Ron, punching Harry in the shoulder. And that’s Ron all over. Harry outshines him, and he just accepts it. The one time it became too much for him, he was back at Harry’s side the moment he came out of his funk and realized that Harry was in danger. Hermione constantly does brilliant things and Ron is right there, clapping his hands, admiring her. How do you remember stuff like that?” asked Ron, looking at her in admiration. “I listen, Ron,” said Hermione with a touch of asperity. We do try,” said Ron. “We just haven’t got your brains or your memory or your concentration – you’re just cleverer than we are, is it nice to rub it in? Poor Ron Part 2 is here! If you haven’t already, you might also like to check out some of my other Harry Potter rants. I appreciate this post so much, as someone who actually has a very hard time appreciating Ron. 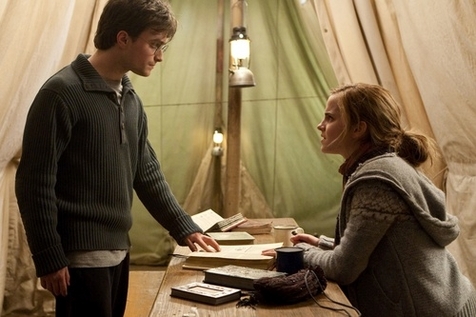 In Prisoner of Azkaban and Half-Blood Prince, particularly, I find his behaviour to Hermione difficult to forgive. It’s easy to imagine that his inferiority complex and capacity for resentment might become significant obstacles to his happiness in a marriage to someone like Hermione – and, aside from fighting evil, it’s not clear that they have many shared interests, so I know where Rowling is coming from when she suggests that they might at the very least benefit from some marriage counseling. One of the most reassuring moments in the epilogue, for me, is the joke Ron makes when his kids notice that people are staring – “Oh, they’re all looking at me – I’m very famous.” A joke like that suggests that Ron has managed to overcome his childhood insecurity (being a war hero might have that effect on a person). As for Ron’s capacity for self-sacrifice, one of my students put together a plausible sequence of chess moves which, based on the clues in the book, might match the game at the end of Philosopher’s Stone. Based on everyone’s position on the board, there were actually TWO moves available that would lead to a checkmate: one involves sacrificing Ron’s piece, and the other involves sacrificing Harry’s. If my student’s set-up is accurate, that adds considerable value to Ron’s decision to not only sacrifice himself so that Harry can move forward, but also keep silent about the alternate strategy (which, presumably, neither Harry nor Hermione would pick up on by themselves). Ooh, that is cool! Yes, I am positive that Ron would never put Harry or Hermione into danger. I think Ron did a lot of growing up in the last book. His battle with the horcrux could be considered to be his fight with his own jealousy. That line of his in the epilogue is pure Ron. He is always using his humor to try to put other people at ease by putting himself down. It’s en excellent example of his humor and humility. I think Hermione’s behavior is worse than Ron’s. In PoA, Scabbers goes missing after Crookshanks has been going after. One very logical conclusion is that Crookshanks got him. Yes, that wasnt the case but the evidence at the time made it at least a possibilty. Ron is more upset because Hermione refuses to even acknowledge that possibility. Rowling writes as much in the book. Its Hermione’s ‘I’m always right’ attitude that prolongs the fight. And Ron does help her with Buckbeak when he sees how upset she is. In HBP, Ron gets together with a girl that makes it perfectly clear shes into him, unlike Hermione. It would be easy for Ron to conclude Hermione asked him to the party because she pitied him because he was not included. And she did have a habit of shoving her friendship with Krum in Ron’s face. Then in a jealous fit, she attacks him with birds. Ron only makes fun of her after she laughs at him, something she never does. That hurt Ron worse than the birds. And Ron does try to make peace but Hermione wants no part of it. I like Hermione but she is very flawed and insecure herself. I think Rowling tried to show this and did an okay job but for whatever reason, fans want to ignore it. As for common interests – books vs Quidditch – who cares? I know lots of couples who have very different interests but what makes them works is they share the same values and beliefs. And Ron and Hermione spend a lot of time alone. I doubt they’re just talking about Harry during that time. Harry even mentions being jealous because it looks like had fun without him. Something else that gets ignored. I think is the portrayal of Hermione as Emma Watson in the movie that screw people thinking! The movie overplayed her good quality, as well as downplaying her bad. Good post. It is great to see you doing your literary analyses again. Not even JKR will convince me that Ron and Hermione weren't meant to be. This is delightful. I always preferred Ron to Harry. At least Ron’s neuroses make sense to me. I’m so glad to see another literary critique. I always felt Ron was very endearing in his own way and I definitely preferred him over Harry and I especially loved his interactions with his brothers. this was beautiful and I agree with you they are perfect for each other I loke J K Rowling for bringing this characters to us but I really can’t understand what she was trying to do by expressing his regrets of how she involved them, I think Hermione grow to love him deeply because he at his way listened and he cared a lot and he loved bravely and relentlessly and just he was ultimately beautiful in that way that shines your day. If anything I think this two where what was supposed to happen since book one, the very beginning when they both met for the first time. 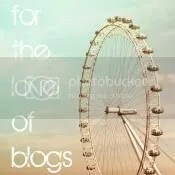 I really like your post! It express everything i was feeling when i read that article. Thank you! 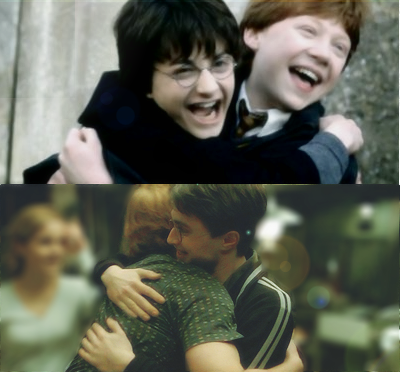 With out Rons friendship Harry would have been very different. Ron taught Harry about what it is like to be a wizard. Ron has great values and his family treated Harry as one of there own. I love the fact that Ron, Harry, and Herminie became family. aah i always loved ron nd will continue doing that.. but its been a while i lookd back in harry potter series … nd uh jst made me realised why i love him … nd now i want to read it again… ron was the one who made harry his friend but even his own family considered him to be lucky that he has harry as his frnd.. arthur mentioned this aftr snake accident with him…. he always appreciated othrs bt nvr recieved that same reactions from othrs…. last book was real good for him … nd still in end appreciates hermoine quality telling her daughter dat he is grateful that she got her mothrs brain. Just Brilliant..!!! I never underestimated him while reading books. I found him having good sense of humor. Absolutely Ron and hermione are made for each other. This is a brilliant piece of insight into the character Ronald Weasley. It is so good that it makes me want to pick up the books AND movies again and just pour over them. The Harry Potter world really isn’t so shallow if you give it a chance. Wow this was brilliant… I gotta admit though, when JK Rowling said that Hermione was better off with Harry I was one of those who said “FINALLY.” because I always thought Hermione and Harry’s personalities were more suited to each other and I was kinda disappointed with Ron ever since he left his best friends in Deathly Hallows. However, after reading this rather amazing post, I’d have to agree that Ron definitely has some redeeming qualities and helps to balance the trio. I don’t know if he’d still be the best choice for Hermione (not that she has to get together with Harry, there are other wizards, hell, even muggles out there) but you’re definitely right in saying that he is really underestimated in the series. Stay tuned for part 2 where i make the argument tjat Ron is better for Hermione! have you ever read Cirque Du Freak series by Darren Shan? Could you do a comparison about it with Harry Potter if possible? I love this read, Ron has always been my favourite, and I always felt bad for him for being so… understated. No, I haven’t, but I’ll look into it! Thanks for the reply! would love to seea part 2 to this as well. You summarised and analysed so well it’s amazing. what’s your take on the fan theory of Ron being Dumbledore travelling back in time? Part 2 is up! That fan theory came up before the series was done and has been laughed off by Rowling. I think the last book, with Dumbledore’s biography, pretty much blew that one out of the water. Ron’s a good guy and smart, but he ain’t no Dumbledore. I love this post like mad because honestly, everyone needs to love Ron. He is seriously one of the freaking best characters in the book although I have to agree with Rowling in the sense that I don’t think Ron and Hermione would have worked out, not because Ron is bad but because I don’t feel their characters match well. I feel like Hermione constantly undermines, underestimates and dismisses Ron as one inferior to her. Ron really deserves someone who appreciates him fully and isn’t going to mother him the way Hermione does but instead inspire him to really be better and happier as a person. Hermione, i feel, tends to just continuously baby him. Hermione, on the other hand, needs someone who is just as competitive and infuriatingly know-it-all as she is to keep her on her toes. Just my two cents but again, absolutely adore this post. Ron seriously deserves more attention and praise. My second part is finally up where I argue that they ARE a good match! Reblogged this on Long Thoughts and Mini Disasters. I have posted a lot of my thoughts on the second part of your Ron post so I thought I share my thoughts here as well. I hope you’ll find the comments here useful. I am always under the impression that the grades on the OWLs are actually harder to achieve than the equivalent As, Bs, Cs in the Muggle world. Even Hermione wasn’t able to get an O on DADA so it doesn’t sound like it’s the equivalent of an A. A lot of people who think Ron and Harry were mediocre students seem to be comparing them to Hermione, not realising they can’t be compared to the brightest witch of her age. Another instance that shows Ron’s acting skills is when Ron pretended to be asleep during Lavender’s visit in the hospital wing in HBP. It helped him to keep clear of his clingy girlfriend. As for his two fights with Harry: obviously what he did in his fights with Harry were wrong, but they are far more complex than given credit for by the Ron haters who are intent on painting him as a treacherous friend. They also forgot Harry was not a paragon of virtue either. The fight he had with Harry during the Triwizard Tournament happened because he felt betrayed that Harry went ahead and entered the tournament without him, not simply because he was jealous of famous Harry’s attention. Plus, Harry could simply have explained to Ron when Ron ASKED about Dumbledore’s speculation that someone entered him to kill him. Instead of talking, he chose to feel butthurt. Then the next day, Hermione who understood Ron’s feeling of inferiority pointed it out to Harry but Harry chose to feel even mort butthurt instead of trying to talk to Ron. Ron was still concerned with Harry’s wellbeing when they were fighting (even though he might not have shown it) otherwise he would not have went downstairs to the common room to try to find Harry when Harry was talking to Sirius at the fireplace. I wouldn’t even classify Ron walking out in DH as abandonment. Remember he wanted to come back the moment he Disapparated but he was prevented from doing so because he ran into some Snatchers. So it’s more like getting away from the distressing mess they were in and cool down for a few minutes and then return. People also forgot that he alone was splinched and almost killed when they escaped from the Ministry and he had the most to lose by going on that quest. This is because 1) Unlike his best friends, he can go back Hogwarts and enjoy a relatively comfortable life despite the oppression because he’s pure-blood and 2) His family will likely be targeted, tortured and killed if the Death Eaters ever found out that he was helping Harry Potter. So it doesn’t mean he’s a coward or traitor for not feeling well during the trip. Also Harry already told Ron to bugger off three times during their fight before he left so it’s not like Ron just decided to leave suddenly. The detractors also forgot that he stood by Harry when the whole school turned against him after he lost 150 points with Hermione and Neville in PS, when the whole school though he was the Heir of Slytherin or when most of the school thought he was a nutter and liar in OotP.